Jimmy Carter has just put yet another exclamation point on the most remarkable post-presidential career in American history (my vote for second place is William Howard Taft, who became a justice of the Supreme Court). President Carter's candid and courageous stance in revealing the existence of four metastatic melanoma lesions in his brain will do much to at last put the stigma of "canceraphobia" to rest. He is not the first President with cancer and, indeed, not the first with melanoma. Only one of his predecessors is presently acknowledged to have died of the disease, Ulysses S. Grant. Grant's throat cancer, quite atypically of the time, was revealed to the public early on in the course of the disease. A storm of media attention ensued and Grant was hounded by the press even after seeking refuge in upstate New York. He spent his last days writing his memoirs (with the capable assistance of Mark Twain) and died as he had lived, with great courage and dignity. Grant's cancer occurred years after his presidency. The first sitting president to be diagnosed with the disease was Grover Cleveland, who in the course of his first (non-consecutive) term developed a modestly invasive carcinoma of his hard palate. He was spirited onto a boat on the East River and a team of surgeons, headed by William Williams Keen (yes, the same guy who misdiagnosed FDR's polio in 1921) proceed to remove a significant amount of the presidents upper jaw and fitted him with a prosthesis (there were actually two operations). A detailed account of the procedure was leaked by one of the surgeons to a reporter who shortly afterwards published a truthful and detailed account of the procedure. Apparantly candor of a sitting president was not that of Grant and there was soon a very active campaign of denial. The poor reporter was disgraced and his reputation not restored until Keen published an account of the operations in 1918, long after Cleveland had died. See my previous blog post for details. A few weeks after the operations, Cleveland was back at the White House and, after a four year hiatus, was re-elected to a second term. 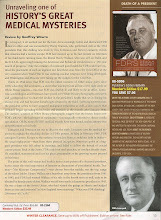 Now we get to FDR, whose penchant for secrecy about his health was legendary. His melanoma was probably diagnosed as early as 1936 and a bleed into a brain metastasis was the final event that ended his life on April 12, 1945. The secrecy is so deep that one can only speculate why he chose to keep it a secret. Clearly, any hint of cancer would have brought his political career to a screeching halt and history would have been robbed of his magnificent leadership during the events preceding and during WW2. The treatment for melanoma then is what it was until only a little more than a decade ago (remember John McCain? ), wide excision and radiation. Likewise, the prognosis for stage four metatstatic disease had not improved - zero survival. We are now at the dawn of entirely new age in cancer treatment and President Carter has a far better chance of survival, even at age 90, due to the remarkable new advances in immunotherapy. It is not at all surprising that melanoma went to President Carter's brain. No other tumor metastasizes there more frequently. In patients who die of melanoma over ninety percent have brain metastases at autopsy and over a quarter of all patients who die of the disease are carried away by a brain hemorrhage (see FDR!!). The only sitting president to reveal that he had surgery for a cancer was Ronald Reagan, at which time a relatively innocuous sessile colon polyp was resected and brought about a cure. Indeed, the publicity around Reagan's cancer did much to raise awareness of the need for colonoscopy for diagnosing colon cancer and was responsible for identifying thousands of curable lesions. Get well soon, President Carter! and thanks for for making cancer a little less scary for the citizens of the world.